South American street and snack fare explores the wide diversity of the imaginative Latina kitchen. 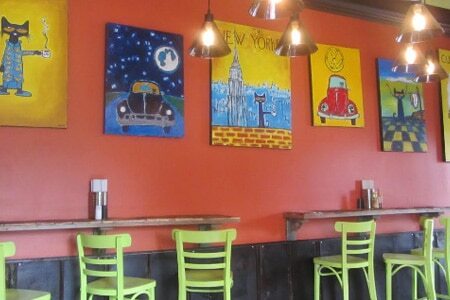 : Small and filled with lively color, Calle Latina offers a menu based on the street fare traditions of South America. Start with soup, such as the chorizo-flecked black bean with cilantro cream. It’s fairly filling, making it a meal all on its own. For a lighter option, try the poblano cream with flecks of cilantro on top. Move on to a salad such as mango slaw. Empanadas, while not the straightforward traditional sorts found in Chile or Argentina, are imaginative and true to the spirit (go for the barbacoa and crab versions). We also enjoy the tortas, especially one with slow-roasted pork shoulder and a habanero mango slaw that’s not at all over-the-top hot. Arepas and tacos are in abundance as well. At dinner, heftier plates prevail but continue to explore the same culinary traditions. Vegetarian and gluten-free options are numerous. For dessert, there’s a standout tres leches cake. The smart wine list is short but extremely well chosen, drawing from the Spanish-speaking world at large and including some very unusual selections, all right on target as to compatibility with the food and price.